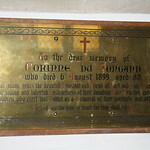 This plaque was commissioned and donated by Charles Page Cory. He was Rector of this church from 1915 to 1937 and succeeded the Rev. Lucas. He was educated at St John’s College, Cambridge and ordained in 1886. He held various posts in Burma from 1892 and became the Archdeacon of Rangoon in 1906. His son, Charles Woolnough Cory was killed at Gallipoli in 1916. The Rev. Cory enjoyed shooting and appears to spend quite a lot of time doing this. According to one of his letters, he joined between 23 to 35 shoots a year with Lord Rendlesham, Lord Ullswater and other local landlords. 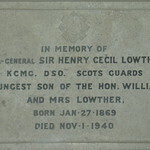 James Lowther was born in 1855, the eldest son of Hon. 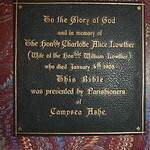 William Lowther and Charlotte Alice, nee Parke. He was educated at Eton College and King’s College, Cambridge and also Trinity College. He studied law and classics. He became a barrister in 1879. He married Mary Frances Beresford-Hope and they had one son Christopher. James had a distinguished career in politics and on his retirement as Speaker of the House, a peerage was created for him and he became Viscount Ullswater of Campsea Ashe. The family lived at the High House, which was the family’s country seat. James died in 1949 at the age of 94 years. Alexander Inglishe is believed to have been rector of this Parish from 1447 to 1504. 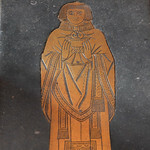 The brass memorial shows the priest in full canonical robes, holding a chalice of water in his hands. It is one of only four in the County showing a priest celebrating Eucharist. The inscription in Old English reads as follows; “Alexander English sometime parish priest of this place on whose soul Jesu have mercy”. 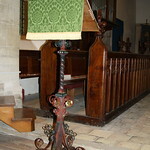 The Pulpit was given by the Graham family in memory of Captain Lord Alastair Graham. It was dedicated by Bishop Lesley Brown, at a special service. Lord Alastair Mungo Graham was born on 12th May 1886. His parents were Douglas Beresford Malise Ronald Graham, 5th Duke of Montrose and Violet Hermione. He was a captain in the Royal Navy. He married Lady Meriel Olivia Bathurst on 4th May 1916. They had four children. Lady Meriel died in January 1936. Alastair married for a second time to Sheelah Reade, daughter of Essex Reade and Sheelah, nee Chichester. They lived at Chantry Farm. Lord Alastair died in 1976. 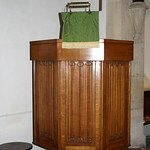 The lectern was given in memory of the young wife of the rector, Goodwyn Alfred Archer, who was the incumbent of this Parish from 1876 to 1891. Kate Harriette Archer died at the age of 33 and was buried on 19th August 1889. The Church Bible was presented by the parishioners of Campsea Ashe, in memory of The Hon. Charlotte Alice Lowther. She was born in 1825 and was the third daughter of James Parke, 1st Baron Wensleydale and Cecilia. Her father James was a highly respected judge. She married William Lowther on 17th December 1853. They had seven children, 4 boys and 3 girls. In 1882, William bought the High House in Campsea Ashe and they made it their country home. Charlotte was very well liked and respected in the village for the support she gave to the community. William Glover was born in Campsea Ashe in 1589. He was the grandson of John Glover, who started the building of the High House in 1558. His father, William, completed the mansion by 1600. William inherited the High House and its estate on the death of his father William in 1629. William married Anne Blennerhassett of Loudham, daughter of Samuel. They had 3 children, all born in Campsea Ashe. Unfortunately, William was attacked and killed by two men outside the White Hart Public House in Wickham Market in 1641. He was 52 years. 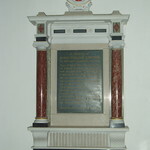 His memorial depicts the Blennerhassett Coat of Arms in a quartering of the Glover’s shield. Four generations of the Glover family were Lords of the Manor for 94 years. The High House and the Estate was sold to John Sheppard of Mendlesham in 1652. The Blennerhassett family appears to have originated from the north of England. 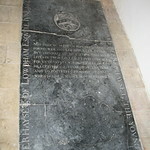 A Ralph Blennerhassett married a Joan de Loudham, aged 14 and already a widow, in 1423. Two of Ralph’s grand daughters entered the Order of St. Clare at Campsea Convent. One of the daughters, Margaret became Prioress. Sir Thomas Blennerhassett, grandson of Ralph married Margaret Braham in the early 1500’s. The Brahams were an important family in Campsea Ashe. These events link the Blennerhassett family to Campsea Ashe. They were Lords of the Manor of Loudham. Edward was the great, great grandson of Thomas and Margaret. 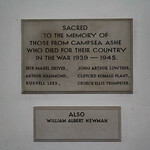 He was born in Campsea Ashe in 1604. He was educated at Peterhouse, Cambridge. It appears that he did not marry. He died in 1641, aged 37. 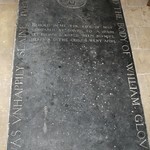 He was the brother of Anne who married William Glover. Poor Anne lost both she husband and dear brother in the space of a few months. The Communion rail was presented by Frederick W. B. Thellusson, 5th Baron,Lord Rendlesham in memory of his wife, Lady Egidia, who died in 1880. Lady Egidia was the daughter of Archibald Montgomie, Earl. 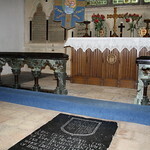 Lady Rendlesham, with her companions, made a carpet for the chancel, small pieces of which can still be seen in the church as runners in some of the pews. The Brame or Braham family originated from the Wetheringsett area of Suffolk. John Braham was Lord of the Manor of Ashe around 1590. He married Rose Armiger of Campsea Ashe. His son John (2) succeeded him followed by his son, also named John (3), who was born in the village in 1635. 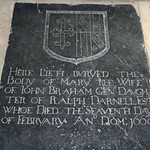 He married Mary Darnell, daughter of Ralph Darnell Esq.. Mary died in child birth and was buried in February 1660. Her large memorial in the centre of the chancel, shows the importance of the family in the community and also the grief of the family. The Braham family lived in the village at Chantry Farm and were Lords of Ashe Manor from 1590 to 1706, although some members continued to reside here until the mid 1700’s. 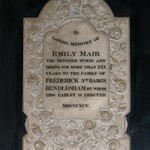 Emily Mair was a nurse to the Rendlesham family. She was born either in Sevenoaks or Tunbridge Wells, Kent in 1830. Her parents were Samuel and Maria. In 1851 she was a nursing maid to Richard Bulkeley’s family, at 87, Eaton Square, London . He was a Baronet and MP. Emily was 24. In 1881, now 51, she was “living in” at Rendlesham Hall, employed as a nurse. John Wilson Sheppard was born in Campsea Ashe in 1798. 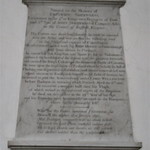 His father was John Sheppard, born 1768 and his mother , Letitia Wilson of Didlington, Norfolk. John Wilson married Harriet Crump in Campsea Ashe Church in 1823. Harriet was the daughter of Colonel Crump of Allexton, Leicestershire. John and Harriet lived at the High House and he was Lord of the Manor. The Sheppard family had been owners of the stately mansion since 1652. John Wilson Sheppard held the post of High Sheriff of the County of Suffolk in 1830. Whilst presiding at the Assizes in Bury St. Edmunds and after a very long and difficult case, John died suddenly in the bathroom of his lodgings the same evening as the case ended. 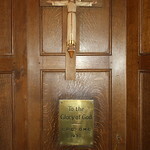 The Coroners Inquest found that he died “of a visitation of God”. John was only 32 years and was buried in the family vault in Campsea Ashe Church. He left a young widow and four children under the age of seven. Sir Henry was the 4th son of the Hon. William Lowther and the Hon. Charlotte Alice Parke. He was born on 27th January 1869 in Ampthill, Bedfordshire. He was a British General and Conservative Politician. Sir Henry was a big game hunter and adventurer. He was elected Fellow of the Royal Geographical Society in 1901. In his military career, he fought in the Boar War, 1899-1902, and commanded the 1st Battalion of the Scots Guards in World War 1. He was wounded in 1914. Sir Henry became a Commander-in-Chief at General HQ in France in 1915 and became military secretary to HRH the Duke of Connaught. In 1916 he was decorated with Legion d’ Honneur. Sir Henry married Dorothy Harvey in 1920 at the age of 51! He died in 1940 in Basingstoke aged 71. Corinne was born in France around 1820. In 1841, she was living with her mother Jenne Maria Loyardy du Jongard, aged 65 and of independent means. In 1861 she was living at the residence of Lady Cecilia Wendsleydale and James, Lord Wensleydale at Ampthill Park House, Bedfordshire. Corinne was 42 and a governess. In 1871, she was still at Ampthill Park House and governess to James, later Speaker of the House, and his siblings. She had retired by 1881 and was living in lodgings in St. George’s Hanover Square with her sister Ophelie. Frederick Sheppard was the fifth son and youngest child of John Sheppard of Wetheringsett and his second wife, Mary Revett. Frederick was born in Campsea Ashe in 1791. His father had inherited the High House and its Estates from his godfather, another John Sheppard in 1747. Frederick had 4 step-sisters and 1 step brother as well as 3 brothers and 4 sisters. (3 of his siblings died before he was born). Frederick grew up with the family at the High House. Frederick “chose” a career in the army and he joined when he was just 9 years old. He was on active service at the age of 10! The inscription on the memorial gives details of his military career. By the time Frederick was killed in 1812 at the age of 21, only 5 of John’s 13 children were still living. 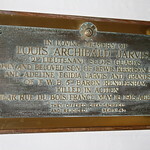 Lieutenant Louis Archibald Jarvis was the only son of Lewis Kerrison Jarvis and Lady Adeline Thellusson, daughter of Frederick W. B. Thellusson, 5th Lord Rendlesham. Louis was born in January 1892 in Colchester. He was killed in action on 16th May 1915. His name is listed amongst the fallen of “The Immortal Eighty at Festubert”. The 2nd Battalion of the Scots Guards were cut off and wiped out by the enemy on 16th May 1915. The Company was inspired to fight to the death after the shame of one of their members who was executed for desertion. They were in the front line and ordered to hold their position at all costs, which they did. Louis was buried in the Guards Cemetery, Windy Corner. Pas De Calais, France. He was 23 years old. Louis’s father was educated at Harrow and Trinty College, Cambridge. He was a great sportsman and a member of the 11 who defeated the Australians at cricket in 1878. Lewis entered the private banking firm of Jarvis and Jarvis. He married Lady Adeline Thelluson on 22nd April 1891. 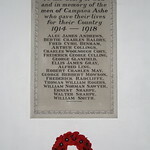 The children at Campsea Ashe School were given that day off. Louis was their only son. Major Lewis died on 16th May 1938 aged 80, exactly 23 years to the day that his son was killed. The Hon. Adeline died the same day as her husband, aged 75. Letitia was born in 1768 into an aristocratic family with links to 2 other notable families, the Knyvetts and the Bouchiers. She was the daughter of Henry W. Wilson Esq. and Mary, nee Miller of Didlington Hall, Norfolk, a very impressive Elizabethan mansion with moat and drawbridge which had been in the Wilson Family since the mid 1600’s. She was one of 8 children. Her two older brothers Robert and Henry, inherited the title of Baron Berners. 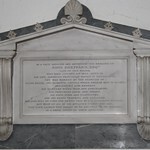 She married John Sheppard, born 1768, eldest son of John Sheppard of Wetheringsett and Elizabeth Whipcopp in 1797. They lived at the High House, Campsea Ashe. They had one son, John Wilson Sheppard, born 1798. Her daughter-in-law, Harriet Sheppard, nee Crump, widowed at the age of 29, married Letitia’s nephew, the Hon. Robert Wilson. Their daughter,( Letitia’s grand daughter), Emma Harriet Wilson inherited the Barony and became the 12th Baroness Berners. Letitia was very well connected with the higher social classes! 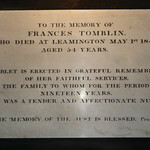 She passed away in 1846 at the age of 78 and was interred in the family vault on 24th February of that year, according to her Last Will and Testament, with her beloved husband John. John Sheppard was the husband of Letitia above. He was born in Campsea Ashe in 1768. His father, John Sheppard of Wetheringsett, inherited the High House and several estates on the death of his godfather in 1747. Young John, the eldest son, inherited from his father in 1793. John had four sisters, three of whom died at a relatively early age and did not marry. His mother Elizabeth nee Whincopp, died when his youngest sister, Charlotte was born. John was only 4 years old at the time. When his father married again to Mary Revett 4 years later, 8 more children were born to John and Mary. Sadly, four of these children died before their 12th birthdays. John’s youngest step-brother was Frederick, who was killed in action in 1812. 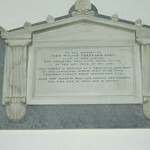 John died at the age of 56 and was buried in the family vault in Campsea Ashe Church in 1824 when he was 25 and was Lord of the Manor for 31 years. 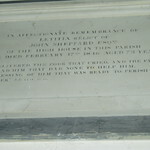 The location of the Sheppard family vault is unknown but it does contain at least 14 members of the family if not more. It is hoped that we may find it someday. William Albert Newman, born 1895, served in the Royal Army Engineers in both World Wars. He had two sons, Albert and John, both of whom served in World War 2. William died in 1951 as the results of wounds whilst on active service. He was 56 years old and he is buried in Campsea Ashe Churchyard.